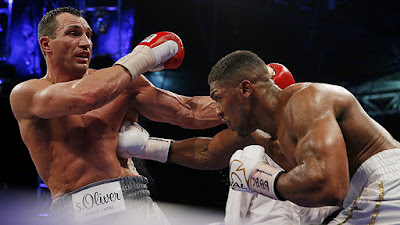 LONDON, England -- What a heavyweight fight for the ages, and what a night at the national football stadium as Anthony Joshua ­finished Wladimir Klitschko after 11 dramatic rounds. Joshua showed us over those pulsating, thrilling rounds that there will be drama in his career, and that his powers of ­recovery are extraordinary. Heavyweight boxing is like no other sporting competition on earth. It is about knockouts, knockdowns and power. We got all three as two huge men, giant human beings and athletes, let their hands go. It was headed to a close finish. Yet Joshua made it emphatic, after encountering demons himself. He will study those long and hard, and has said that a challenge like this would bring out the best in him. This is the Joshua the public wanted to see. Indeed, it is the Joshua that he wants to be. A fighter’s heart drove the Londoner on and on, and come the 11th round, with the vim back in his body and his head clear, Joshua did as he had promised and ‘‘unleashed hell’’, two left hooks poleaxing Klitschko as the young warrior, recovered, went hunting for the finish. It was impossible to predict how this contest would play out given the ­imponderables and, in the end, the younger man by 14 years had to endure a learning curve of a fight and the heavy hands of a great former champion, with his youth seeing him through. Joshua will take so much away from this. From first to last, the fight was ­absorbing, pulsating, with all the thrills and spills that will carry a nation and a generation along on Joshua’s journey. There is clearly something special about Anthony Joshua. But oh, what a lesson in boxing he was forced to come through against Klitschko who summoned something great from those 41-year-old legs of his. Hurt in the fifth and on his haunches, Dr Steelhammer displayed deep ­reserves, and the epitome of a champion’s heart. “I’m not perfect,” admitted the young pretender to the entire heavyweight fraternity. Last night, ‘AJ’ retained his International Boxing Federation crown, added the vacant World Boxing Association belt and drew more plaudits as a sports figure who demands that respect play a part in the sport. Out in a white robe aping Muhammad Ali himself, so relaxed, Joshua had raised a white gloved hand to friends and family sitting ringside. From there, it was a cagey start and a night that ­began the coronation of a new sporting star, given the interest generated globally in 140 countries and particularly in the frenzy of attention in the last 72 hours. The respect levels in this promotion were down to the two men, who deserve acclamation for both performance in the ring and out of it. Oh how the stadium erupted at the finish and when the triumphant Joshua took to the microphone. “What can I say, first and foremost,” he said in that way of his, fired still by adrenaline. Klitschko was magnanimous in ­defeat. The dust will have to settle before rematches are discussed, but Klitschko was close to winning this fight, having hurt Joshua at the midway point. Joshua was already a world champion. But this was his real arrival at the head of the division. The nights will only get bigger and better from here.